Suzy arrived safe and sound last night and we had a happy family reunion. We talked long into the night about jobs, baseball (if I say “Go Sox!” here, it might just make my husband’s week, so: GO SOX! ), falcons, travel, grief, food, Chicago and poker. Suzy discovered the PSP and a little game called “World Championship Poker 2: Featuring Howard Lederer.” She surprised both Sean and I by showing exceptional natural aptitude for No-limit Hold ’em. Currently, I’m considering taking her to Vegas as a ringer. I got up early and tip-toed out of the house, leaving a “Falconing. Be back soon. I mean it. Soon. I promise this time. Love you.” note on the kitchen island. First things first, I checked the perimeter of MCC for any fallen chicks. Happily, I found nothing. Rain drizzled out of the sky, so I went to the garage’s covered 11th floor instead of the roof. 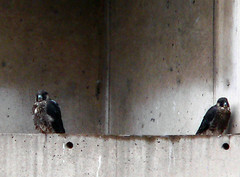 Herc and Max were nowhere to be seen, but two wet and rather miserable looking chicks toughed it out on the ledge. Instantly, I recognized the male, huddled against the westernmost wall. He looked far wetter than his sister, who was holding court in the center of the ledge. The female opened her mouth as if to respond and let out a gusty ‘screee!’ She looked around expectantly, turned, and hopped back into the nest. For the next hour, the male sat, feathers puffed out, down on his feet. It stopped raining, so I thought I’d go up on the roof to scope for Herc and Max before I headed on home. I couldn’t see either of them as I walked down to my stairwell post. I set up my tripod and attached my spotting scope just in time for Max to come in from the east and swoop up to the stairwell roof! The post next to the stairwell provides the closest, straightest view of the nesting site, so I’ve always favored it. On these special occasions with Max lands on the roof of the stairwell while I’m at this post, I am in the closest proximity to him as either adult falcon ever allows, with him barely four feet directly over my head, but out of sight. If I’m not jonesing for a look at his leg bands, so backing up slowly to an incline at the halfway mark of the roof so that I can see him, I savor that shared space. Every time I’ve stayed, Max has come to the edge to peer over at me. I’ll hear the tap-tap-tapping of his talons on the metal edge of the rooftop. When the tapping stops, I can slowly look up and there he will be, leaning out over the edge to look straight down on me, eye to eye. If I were a stupid person, I would reach up and skritch the underside of his big falcony chin. While I will admit to spacey, absent-minded and at times even absurd, I’m not stupid. I’ve never even moved during these moments. Still and all, it’s breathtaking to be that close and to know that he is taking me in just as I am taking him in. The first couple of times this happened, I was wary because I had no idea what he might do. My mind’s eye imagined him dropping, lightening quick, onto my face and snipping my eyes out of their sockets. However, my mind’s eye often favors gory special effects like that and 98% of the time, things turn out just fine. 100% of these times with Max, he’s not only allowed me to keep my eyes, but hasn’t really reacted to me much at all. It’s a quick, curious look I get from him before he’ll tap back out of site to do whatever he came there to do. Back to present, Max swooped up and tap-tap-tapped over, craning his neck to look down at me. I looked up. He took off. As he rose into the air, heading for the skyperch it looked like, I heard another falcon call down. Herc was on the skyperch. Max answered. Herc responded. Max landed and Herc took off. She dove, heading straight for me. This, too, has happened with regularity as I am in the dive-swoop path from the skyperch to the nest. On one or two occasions, she or he has gone about 3 feet over my head on their way to the nest. It’s happened often enough, in fact, that I started to count the dive awhile ago. Usually on the “thous” of the “6-1000,” she/he hits the base of the swoop and levels off, buzzing over me on the way to the nest ledge. So, out of habit, I started the count. Something seemed different. I think it was probably the fact that Hercules had never screamed in rage while descending before. That, by the by, is what is called a “brilliant animal behavior observation” (for those of you who don’t know me, that last was uttered in my most sarcastic tone). “Hmm-1000,” I thought. “She’s-1000 mad-1000.” Another brilliant observation. Too late to do anything more, I turned my head, silently thanked myself for wearing a baseball cap today, closed my eyes, tensed and continued the count. At the “6”, I turtled my head into my collar and ducked. It turned out to be a good move on my part because on the “one th..”, Herc hit me with the back of her knuckle, knocking my hat off my head. Thankfully, my evasive maneuver resulted in her sharp back talon scraping across blank space instead of scalp. She veered and swooped up to land on the Monadnock ledge where she immediately turned, looked straight down at me, and screamed again. “Hrrrmmm, yeah,” I coughed. “Message received LOUD and clear, Herc. Babies are on the ledge and I am no longer welcome to stand this close. I got it. Moving back. Real slow. Moving back. Calm down,” I said quietly as I very slowly grabbed me things and backed away. As soon as I got to the halfway point of the roof, she calmed. I stood there a moment just to gauge her temper and then decided to pack it in for the day. I didn’t want to be late home, after all. It had nothing to do with angry falcons. Sheesh. As I thought, I wasn’t the least bit cut. There was a little bump on the back of my head and, Sean said, a bruise, but that was it. Herc just gave me a little warning tap to let me know that things had changed. I’m cool with that and will fully respect the new borders. ~ by Steph on June 10, 2006.